With their long fibers creating clogs, pineapples are one of the most difficult fruits to juice. But with these tips, you can enjoy fresh pineapple juice without worry. When slicing the pineapple, there is no need to remove the core. 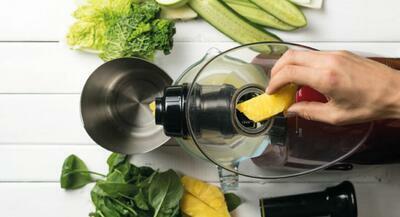 The core not only contains juice, but also provides solid material to help force the softer pulp through the juicer. Instead, separate the core when slicing the pineapple and cut it into small cubes. Alternate juicing the pineapple flesh and the core. After cutting top top and bottom and removing the skin, cut the pineapple from top to bottom into thin vertical strips. This will not only make it easier to feed into the juicer, but will also make the fibers more manageable for the juicer. Carrots make a great complement to pineapple juice, mellowing out the super-sweet taste a bit. They also make juicing pineapples much easier. Just alternate a carrot after a few pineapple spears, or when you sense the machine is starting to back up. The carrots will help scrub out any pineapple fiber blocking the juicing screen or auger. You should never try to overfeed or force your slow juicer. This is especially true for pineapples. Feed the pineapples slowly, and allow the juice to process each slice before adding the next one. Overfeeding won't get you juice any faster, and could jam the machine. A fully ripened pineapple will have golden skin and is great for eating with it's super-sweet flesh. But it is bad for juicing for two reasons. First, the softer flesh is more likely to cause jams and clogs. Second, the sweet flavor is more concentrated when juiced and can be overwhelming. The ideal pineapple for juicing will be firm but still sweet. Look for green pineapples with a golden base. Sniff the base - it should smell sweet.